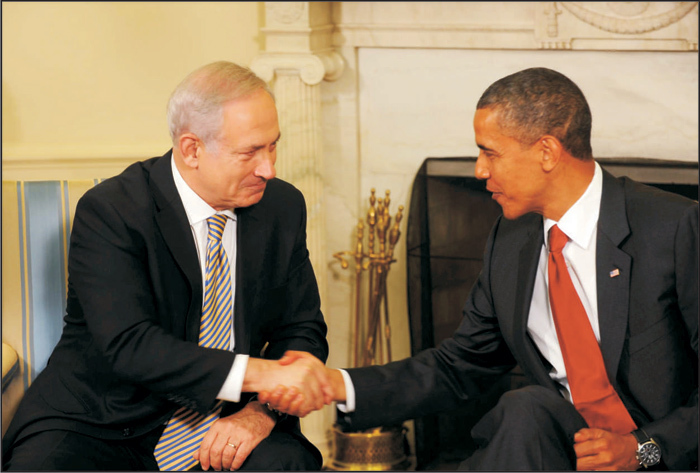 US President, Barack Obama (left), and Israeli Prime Minister, Benjamin Netanyahu, during the Middle East Summit. PRESIDENT OBAMA: Well, I just completed an excellent one-on-one discussion with Prime Minister Netanyahu, and I want to welcome him back to the White House. I want to, first of all, thank him for the wonderful statement that he made in honor of the Fourth of July, our Independence Day, when he was still in Israel. And it marked just one more chapter in the extraordinary friendship between our two countries. As Prime Minister Netanyahu indicated in his speech, the bond between the United States and Israel is unbreakable. It encompasses our national security interests, our strategic interests, but most importantly, the bond of two democracies who share a common set of values and whose people have grown closer and closer as time goes on. During our discussions in our private meeting we covered a wide range of issues. We discussed the issue of Gaza, and I commended Prime Minister Netanyahu on the progress that's been made in allowing more goods into Gaza. We've seen real progress on the ground. I think it�s been acknowledged that it has moved more quickly and more effectively than many people anticipated. Obviously there�s still tensions and issues there that have to be resolved, but our two countries are working cooperatively together to deal with these issues. The Quartet has been, I think, very helpful as well. And we believe that there is a way to make sure that the people of Gaza are able to prosper economically, while Israel is able to maintain its legitimate security needs in not allowing missiles and weapons to get to Hamas. We discussed the issue of Iran, and we pointed out that as a consequence of some hard work internationally, we have instituted through the U.N. Security Council the toughest sanctions ever directed at an Iranian government. In addition, last week I signed our own set of sanctions, coming out of the United States Congress, as robust as any that we've ever seen. Other countries are following suit. And so we intend to continue to put pressure on Iran to meet its international obligations and to cease the kinds of provocative behavior that has made it a threat to its neighbors and the international community. We had a extensive discussion about the prospects for Middle East peace. I believe that Prime Minister Netanyahu wants peace. I think he�s willing to take risks for peace. And during our conversation, he once again reaffirmed his willingness to engage in serious negotiations with the Palestinians around what I think should be the goal not just of the two principals involved, but the entire world, and that is two states living side by side in peace and security. Israel�s security needs met, the Palestinians having a sovereign state that they call their own -- those are goals that have obviously escaped our grasp for decades now. But now more than ever I think is the time for us to seize on that vision. And I think that Prime Minister Netanyahu is prepared to do so. It�s going to be difficult; it�s going to be hard work. But we've seen already proximity talks taking place. My envoy, George Mitchell, has helped to organize five of them so far. We expect those proximity talks to lead to direct talks, and I believe that the government of Israel is prepared to engage in such direct talks, and I commend the Prime Minister for that. There are going to need to be a whole set of confidence-building measures to make sure that people are serious and that we're sending a signal to the region that this isn�t just more talk and more process without action. I think it is also important to recognize that the Arab states have to be supportive of peace, because, although ultimately this is going to be determined by the Israeli and Palestinian peoples, they can't succeed unless you have the surrounding states having as -- a greater investment in the process than we've seen so far. Finally, we discussed issues that arose out of the Nuclear Nonproliferation Conference. And I reiterated to the Prime Minister that there is no change in U.S. policy when it comes to these issues. We strongly believe that, given its size, its history, the region that it�s in, and the threats that are leveled against us -- against it, that Israel has unique security requirements. It�s got to be able to respond to threats or any combination of threats in the region. And that's why we remain unwavering in our commitment to Israel�s security. And the United States will never ask Israel to take any steps that would undermine their security interests. So I just want to say once again that I thought the discussion that we had was excellent. We�ve seen over the last year how our relationship has broadened. Sometimes it doesn�t get publicized, but on a whole range of issues -- economic, military-to-military, issues related to Israel maintaining its qualitative military edge, intelligence-sharing, how we are able to work together effectively on the international front -- that in fact our relationship is continuing to improve. And I think a lot of that has to do with the excellent work that the Prime Minister has done. So I�m grateful. And welcome, once again, to the White House. PM NETANYAHU: Thank you, Mr. President. The President and I had an extensive, excellent discussion in which we discussed a broad range of issues. These include of course our own cooperation in the fields of intelligence and security. And exactly as the President said, it is extensive. Not everything is seen by the public, but it is seen and appreciated by us. We understand fully that we will work together in the coming months and years to protect our common interests, our countries, our peoples, against new threats. And at the same time, we want to explore the possibility of peace. The greatest new threat on the horizon, the single most dominant issue for many of us, is the prospect that Iran would acquire nuclear weapons. Iran is brutally terrorizing its people, spreading terrorism far and wide. And I very much appreciate the President�s statement that he is determined to prevent Iran from acquiring nuclear weapons. That has been translated by the President through his leadership at the Security Council, which passed sanctions against Iran; by the U.S. bill that the President signed just a few days ago. And I urge other leaders to follow the President�s lead, and other countries to follow the U.S. lead, to adopt much tougher sanctions against Iran, primarily those directed against its energy sector. As the President said, we discussed a great deal about activating, moving forward the quest for peace between Israel and the Palestinians. We�re committed to that peace. I�m committed to that peace. And this peace I think will better the lives of Israelis, of Palestinians, and it certainly would change our region. Israelis are prepared to do a lot to get that peace in place, but they want to make sure that after all the steps they take, that what we get is a secure peace. We don�t want a repeat of the situation where we vacate territories and those are overtaken by Iran�s proxies and used as a launching ground for terrorist attacks or rocket attacks. I think there are solutions that we can adopt. But in order to proceed to the solutions, we need to begin negotiations in order to end them. We�ve begun proximity talks. I think it�s high time to begin direct talks. I think with the help of President Obama, President Abbas and myself should engage in direct talks to reach a political settlement of peace, coupled with security and prosperity. This requires that the Palestinian Authority prepare its people for peace -- schools, textbooks, and so on. But I think at the end of the day, peace is the best option for all of us, and I think we have a unique opportunity and a unique time to do it. The President says that he has a habit of confounding all the cynics and all the naysayers and all those who preclude possibility, and he�s shown it time and time again. I think I've had my opportunity to confound some cynics myself, and I think if we work together, with President Abbas, then we can bring a great message of hope to our peoples, to the region, and to the world. PM NETANYAHU: -- you and the First Lady came to Israel, sir. PRES. OBAMA: We look forward to it. Thank you. PRES. OBAMA: Thank you very much. Thank you. All right, we�ve got time for one question each. I�m going to call on Stephen Collinson, AFP. Q. Thank you, Mr. President. As part of the steps which need to be taken to move proximity talks on to direct talks, do you think it would be helpful for Israel to extend the partial settlement moratorium, which is set to expire in September? And if I could just briefly ask the Prime Minister, with regards to the sanctions you mentioned, do you think that these measures will contain or halt Iran�s nuclear program where others have failed? PRES. OBAMA: Let me -- let me, first of all, say that I think the Israeli government, working through layers of various governmental entities and jurisdictions, has shown restraint over the last several months that I think has been conducive to the prospects of us getting into direct talks. And my hope is, is that once direct talks have begun, well before the moratorium has expired, that that will create a climate in which everybody feels a greater investment in success. Not every action by one party or the other is taken as a reason for not engaging in talks. So there ends up being more room created by more trust. And so I want to just make sure that we sustain that over the next -- over the next several weeks. I do think that there are a range of confidence-building measures that can be taken by all sides that improve the prospects of a successful negotiation. And I�ve discussed some of those privately with the Prime Minister. When President Abbas was here, I discussed some of those same issues with him. I think it�s very important that the Palestinians not look for excuses for incitement, that they are not engaging in provocative language; that at the international level, they are maintaining a constructive tone, as opposed to looking for opportunities to embarrass Israel. At the same time, I�ve said to Prime Minister Netanyahu -- I don't think he minds me sharing it publicly -- that Abu Mazen working with Fayyad have done some very significant things when it comes to the security front. And so us being able to widen the scope of their responsibilities in the West Bank is something that I think would be very meaningful to the Palestinian people. I think that some of the steps that have already been taken in Gaza help to build confidence. And if we continue to make progress on that front, then Palestinians can see in very concrete terms what peace can bring that rhetoric and violence cannot bring -- and that is people actually having an opportunity to raise their children, and make a living, and buy and sell goods, and build a life for themselves, which is ultimately what people in both Israel and the Palestinian Territories want. PM NETANYAHU: I think the latest sanctions adopted by the U.N. create illegitimacy or create de-legitimization for Iran�s nuclear program, and that is important. I think the sanctions the President signed the other day actually have teeth. They bite. The question is -- how much do you need to bite is something I cannot answer now. But if other nations adopted similar sanctions, that would increase the effect. The more like-minded countries join in the American-led effort that President Obama has signed into act, into law, I think the better we�ll be able to give you an answer to your question. PRES. OBAMA: Is there somebody you want to ask here? Q. Mr. President, in the past year, you distanced yourself from Israel and gave a cold shoulder to the Prime Minister. Do you think this policy was a mistake? Do you think it contributes to the bashing of Israel by others? And is that -- you change it now, and do you trust now Prime Minister Netanyahu? And if I may, Mr. Prime Minister, specifically, did you discuss with the President the continuing of the freezing of settlements after September? And did you tell him that you�re going to keep on building after this period is over? PRES. OBAMA: Well, let me, first of all, say that the premise of your question was wrong and I entirely disagree with it. If you look at every public statement that I�ve made over the last year and a half, it has been a constant reaffirmation of the special relationship between the United States and Israel, that our commitment to Israel�s security has been unwavering. And, in fact, there aren�t any concrete policies that you could point to that would contradict that. And in terms of my relationship with Prime Minister Netanyahu, I know the press, both in Israel and stateside, enjoys seeing if there�s news there. But the fact of the matter is that I�ve trusted Prime Minister Netanyahu since I met him before I was elected President, and have said so both publicly and privately. I think that he is dealing with a very complex situation in a very tough neighborhood. And what I have consistently shared with him is my interest in working with him -- not at cross-purposes -- so that we can achieve the kind of peace that will ensure Israel�s security for decades to come. And that's going to mean some tough choices. And there are going to be times where he and I are having robust discussions about what kind of choices need to be made. But the underlying approach never changes, and that is the United States is committed to Israel�s security; we are committed to that special bond; and we are going to do what�s required to back that up, not just with words but with actions. We are going to continually work with the Prime Minister and the entire Israeli government, as well as the Israeli people, so that we can achieve what I think has to be everybody�s goal, which is that people feel secure. They don't feel like a rocket is going to be landing on their head sometime. They don't feel as if there�s a growing population that wants to direct violence against Israel. That requires work and that requires some difficult choices -- both at the strategic level and the tactical level. And this is something that the Prime Minister understands, and why I think that we�re going to be able to work together not just over the next few months but hopefully over the next several years. PM NETANYAHU: The President and I discussed concrete steps that could be done now, in the coming days and the coming weeks, to move the peace process further along in a very robust way. This is what we focused our conversation on. And when I say the next few weeks, that's what I mean. The President means that, too. Let me make a general observation about the question you posed to the President. And here I�ll have to paraphrase Mark Twain, that the reports about the demise of the special U.S.-Israel relations -- relationship aren�t just premature, they're just flat wrong. There�s a depth and richness of this relationship that is expressed every day. Our teams talk. We don't make it public. The only thing that's public is that you can have differences on occasion in the best of families and the closest of families; that comes out public -- and sometimes in a twisted way, too. What is not told is the fact that we have an enduring bond of values, interests, beginning with security and the way that we share both information and other things to help the common defense of our common interests -- and many others in the region who don't often admit to the beneficial effect of this cooperation. So I think there�s -- the President said it best in his speech in Cairo. He said in front of the entire Islamic world, he said, the bond between Israel and the United States is unbreakable. And I can affirm that to you today. PRES. OBAMA: Thank you very much, everybody.